"BERGMAN at his most POWERFUL! SHOCKING! BOLD!" 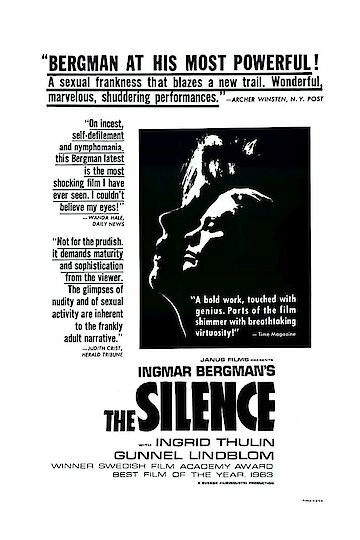 The Silence was an Ingmar Bergman directed film that was released in 1963. Bergman also wrote the screenplay for the film. The movie is about a young family that decides to stay in a European country that is facing the reality of war. The movie is about the family trying to cope and assimilate with their surrounding society. The Silence is currently available to watch and stream, buy on demand at Vudu, iTunes online.